As Associate Curator of Special Collections at Wellesley College, Mariana provides course-integrated instruction to visiting classes, explaining the collections and the value of using primary sources, as well as lecturing on aspects of the history of the book. 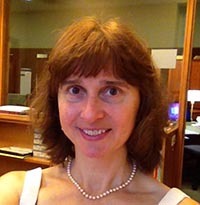 She delivers reference services to the Wellesley College community and outside researchers and ensures access to special collections holdings through cataloging all special collections materials, creating finding aids and guidelines for bibliographic control, and building and curating digital collections. Mariana promotes the use of the extensive Browning Collection holdings through lectures and presentations to various organizations and institutions around the country. Her responsibilities also include collections management and preservation, creating exhibitions, and hiring, training, and supervising Special Collections student assistants. Prior to her current position, Mariana worked as Curatorial Assistant in the Rare Books Department at the Houghton Library, Harvard University. She holds a BA degree in History from Rhode Island College, an MA degree in History from Harvard University, and an MS degree in Library and Information Science from Simmons. Mariana is devoted to the study of American history, most particularly the Revolutionary War Era, the early Republic, and the life and legacy of Alexander Hamilton. She is a founding member and Chair of the Alexander Hamilton Awareness (AHA) Society and its New England Chapter President. Mariana is also a member of the American Antiquarian Society, the Society of Printers, and the Bibliographical Society of America.